Every terrorist attack brings a myriad of tragic stories of lives cut short by extremists who believe that mowing down innocent people will please God and guarantee them a place in paradise. I had to share this picture on one such tragedy in the death of American Jared Tucker, 42, who took this picture one hour with his wife Heidi Nunes before being murdered in the streets of Barcelona Spain. They were celebrating their one-year anniversary. The couple was traveling throughout Europe to celebrate their anniversary and stopped in the famous tourist area of Las Ramblas for a break at a little cafe. That is when the Islamic terrorists arrived to kill as many people as possible by running them over with a rented van. Thirteen people were killed and dozens injured in the first of two attacks. One was Jared Tucker. For the life of me, the only posters on this thread whom I thus far understand are Karen, Darren, Anonymous, Paul and Nick in his initial prayer for all of the families–but not thereafter. The rest of this thread seems utterly alien to me. Why are we pitting one tragic death against another tragic death? What could possibly be gained from such a grudge match? Is this present quarrel merely conditioned reflex? It has the look and feel of experimentally induced psychosis. Pray for peace for yourselves as well. Why are we pitting one tragic death against another tragic death? We aren’t Diane. Just sleep it off. That this man may have had a very happy year, prior to his death, is certainly better than the alternative. That he was apparently happy — according to his father — doesn’t in any way minimize his wife’s pain in the aftermath of his untimely death. And — in point of fact — she may find comfort in it, as well. His father, Dan Tucker, said he had not seen his son happier than he had been in the last year. Why is that so hard for others to accept? It’s not hard for the vast majority of persons over the age of 25 to accept. It’s a reasonable wager that the guy who did this got the idea in his head he’d been humiliated by the generic occidental, so his humiliation is assuaged by killing generic occidentals. (And there’s some progtrash and palaeotrash who are happy to lie to him in the course of lying to themselves when they tell him his problem has a source outside his head, his family, the city he lives in, and the country he lives in). “His father, Dan Tucker, says he had not seen his son happier than he had been in the last year. So then it’s totes OK? Hotsie, Totsie, I Smell A Nazi! My prayers go out to all the families grieving, in the US and Spain. These victims were killed because of hate. And hate must end. Ken, frankly/SWM, and their ilk hate Spaniards.and all people, including this American on his honeymoon. They really don’t care about this poor girl, Heather Heyer, that Desperate posted. They only hate, like the Nazi’s they emulate. They have nothing positive, just hatred. They don’t even like their own politicians, knowing they’re all buffoons, like virtually all politicians. They only hate and have NO CLASS, hijacking this thread JT dedicated to a fallen American, killed by savage Muslims. They have devolved into a subspecies of we humans, just like the Nazi’s. Nick, poor lamb, has really grown unhinged. There was a time when he would mix his invective with a little humanity. Now it’s only hate, hate, hate. It’s what happens with people who have boundary issues. Mediocre schoolteacher now pretends to be a psychotherapist. I luuuv it. I am so sorry for his family’s loss. Was his wife injured, too? What a heartbreaking story. The families of those killed, and all of the injured, are in my thoughts and prayers. What a memory of her anniversary she is going to have. This is so sad, for all killed and injured. I had Europe on my list to visit but the Europeans are all over here visiting because it is safer. Did Turley post an article honoring the woman killed in C’Ville? If so, I didn’t see it. Why is he obligated to? 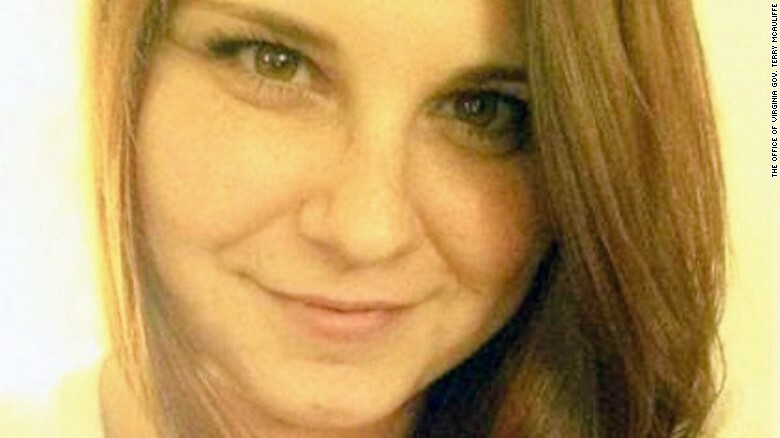 Heather Heyer, a beautiful woman was killed by a Nazi psycho savage. Ms. Heyer, and her mother, Mrs. Bro, have gotten incredible amounts of coverage and payers. I have prayed for Ms. Heyer’s family. I never pray for the dead, believing them to be at peace w/ the Good Lord. The MSM has abdicated its role to keep us informed by putting this savage jihadist attack on the back burner to keep the blitzkrieg against Trump in attack mode. As I said, Ms. Heyer, deservedly so, has gotten wall to wall coverage. We all know her name and face. I think possibly JT saw this Tucker’s families plight being ignored. And, since it’s HIS blog he gets to post or not post whatever HE wants. I would like to thank the other commenters who have told us more about this good, young man and his family. They are in my prayers. Dad seems to be a glass half full guy. That will help him through his dark days. roseanne – we discussed the problems with AntiFa being as bad or worse than the KKK. And I am not sure where that story is going. There is a report that the car was surrounded by people yelling The streets are ours!!! Not yours!!! He may have felt threatened and was trying to escape. Read a history book. Happy Saturday. roseanne – Happy Saturday to you. Currently I am reading a history book on the War of the Roses. I have probably read more history books than you, but it is not a contest. However, what I said is an opinion. White supremacy need not be minimized. The firing of Bannon shows that it is not being tolerated by the centrists.. Will Gorka be next? Frankly/SWM is a heartless, mindless liberal obsessed w/ the coup. Like the equally disgusting MSM, that has almost ignored this terror attack because of the same obsession. Frankly/SWM proclaims to not be a Hillary bot, BUT SHE IS LYING. She has marching orders to hijack heartbreaking threads like this w/ her bile and venom. She is a lying, heartless, liberal and should be treated as such! Come on, frankly/SWM. Ken at least posted a perfunctory comment about this dead American killed by Muslim savages. I’m sure Hillary would want some fake caring from you. Step up your propaganda game. Ken understands the need to feign caring. It is not an either or situation. All terrorists attacks are tragic whether they are done by ISIS or American home grown terrorists. A heartless, mindless, classless response from the Hillbot, frankly/SWM. It is indeed not an either/or, BUT THIS POST IS ABOUT AN ISIS KILLING. So, anyone w/ an ounce of class would refrain from IGNORING this families pain on this post, which up to this point you have done. And, knowing your ilk so well, you will not give an inch and express even a feigned caring. Like Hillary, you are a childish, “You’re not the boss of me” woman. And, that’s one of the reason we men still run this world and own most everything on it. We have true self esteem. Your ilk has none. So, you can never admit you pissed on your leg here. Yes, thanks SWM. We all miss the intellect and wisdom of Toure, a liberal, black man who could not even make it on MSNBC and apparently can’t afford a surname. I’ll buy a vowel for Toure if he wants to create a surname. No, you’re just like the rest. Hate on both sides in C’ville. You lot just feel your hate is more goodr’ and justifiable because you say it is. You poor saps are being worked like checkers. I was going to say “chess,” but that gives you too much credit. Lemmings of the world–unite! It’s like those old Inquisition people who would torture Jews and others to save their souls. Because they were sooo full of love! Dear Ken, Please ask former US AG Loretta Lynch to end her call for violence and blood in the streets of America. Thanks. The rain in Spain stays mainly in the plain. The muslims stay mainly in Barcelona. And to think we want to let these sick animals into our country without extensive vetting. You need to qualify, assimilate and love this country to get in. Knockin’ another one out of the park Ken. How did we ever get by without your enlightening contributions. Ken, the Nazi’s were socialists. Do a little research into what the Nazi party fully stands for. Then tell us all which political party they are more closely aligned with. K? It’s Ken. The content of Nazi ideology & c. doesn’t interest him (and he doesn’t understand it). Just say ‘poopy-pants’ and you’ll get the semantic content in his head. Well, the scary part is that he does “not see” that he is probably closer to being one of them than all the people he keeps calling a Nazi. He ‘not sees’ what he’s doing. Weird. So, I guess we can say that no matter what Ken believes, he is still a “not see” – get it? No picture of the girl killed in the Nazi attack in the USA. They’re all over the internet. I thought that the attack was by a Klan guy. Nazi? Was he Deutsch? German American? Is there a Nazi Party in America? This IS a Klan. There is ISIS. Not the same but two dweebs in a pod. No podcast needed. The attack was by Joe Blow in Toledo. Not sure he had any verified organizational affiliations. There hasn’t been a single ‘klan’ since 1949. There are lots of klanlets, some local, some maintaining skeletal state organizations and about 3 maintaining a multi-state organization. IIRC, the FBI estimates their total membrship at about 2,000. AFAIK, the last homicide attributable to a klavern conspiracy occurred in 1981.